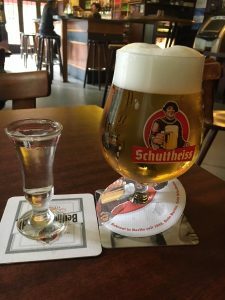 “The most beautiful place is always in the bar (Der schönste Platz ist immer an der Theke),” as Toni Steingass, the German singer and song writer, sang in 1950. There’s a certain kind of bar in Berlin that offers coziness and an undeniable sense of content. 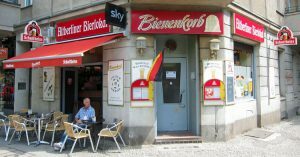 Whereas Vienna has its coffee houses, London its pubs, Paris its Bistros, and Barcelona its Bodegas, Berlin has its Eckkneipen (corner bars) which have been synonymous with an unmistakable popular way of life that’s rooted in the city’s historical development. 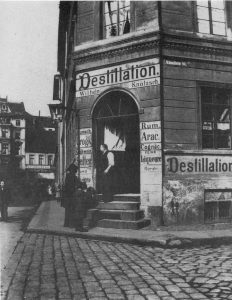 Toward the end of the 19th century, the Industrial Revolution transformed Berlin into an economic powerhouse and the city’s size expanded dramatically. Additional suburbs began to develop as the population continued to increase, and Berlin thus became a largely working-class city. Despite the city’s initial efforts to increase its housing, workers often lived in dark, damp, poorly heated and ventilated dwellings that soon became the breeding grounds for rampant disease, violence, and crime. It was absolute misery for several of Berlin’s new working-class. After putting in an exhausting and physically demanding 12-hour shift, one could rarely relax in such a horrendous place at the end of the day. 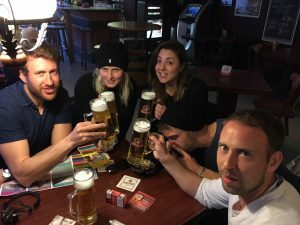 Therefore, to unwind and to avoid the misery at home, workers gathered for a bump and a beer (a glass of beer and a shot of hard liquor) at the nearest Eckkeneipe where they could relax – as if they were at home – and wash down their hopeless fate with other like-minded people. Eventually, living conditions would improve and most people wouldn’t have to rely on their local Eckkeneipe to find solace after a long day’s work (unless if they were deliberately trying to avoid a particular person at home!). Yet, the Berlin Eckkeneipe had given its patrons a sense of belonging to a community – a community in which everybody had an identity among each other in a very large and overcrowded city. By 1931, the renown German author, Erich Kästner, supposedly counted 20,100 Eckkeneipen throughout Berlin. Today there are probably around 2,500 Eckkeneipen throughout the German capital. Because of the city’s booming real estate market and the fact that former undesired neighborhoods have now become trendy hangouts among a new age of residents in Berlin, there’s been a dramatic change in the demographics of those who visit an Eckkeneipe today. A bunch of older folks sitting on barstools, drinking as much as they can and smoking like chimnies have now become a dying breed. There’s now a whole new demographic of people who just want cheap beer, a chance to play darts or pool, and blast Tracy Chapman’s “Fast Car” on the jukebox. Yet, “Long Live the Berlin Eckkeneipe” means that, despite our changing world, tradition and behavior together don’t change. 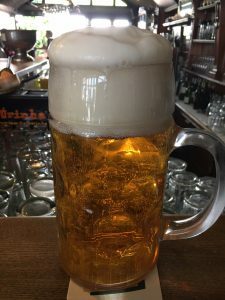 Today when you enter the front door, it’s customary to say “Hallo” or “Guten Tag” to everyone with whom you make eye contact because most regulars who frequent an Eckkneipe simply expect a proper hello from each patron who walks in. Times may have changed, but tradition doesn’t. Head to an Eckknesipe while you’re in Berlin. Usually, there’s just one person running the bar, so don’t grow impatient if it takes a minute or two for him or her to get to you. It’s also worth mentioning that there’s a special art when it comes to pouring an Eckkeneipe beer, so be patient after you’ve ordered. Feel free to strike up a conversation with the person nearest to you because remember, it’s all about feeling content and relaxed as if you were at home.